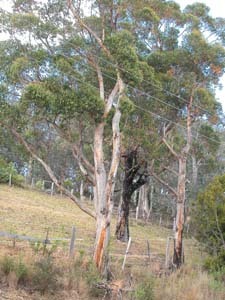 Eucalyptus obliqua (Stringy Bark) is a widespread and very common species. 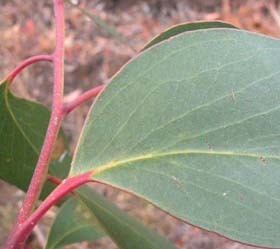 It can be a dominant tree in tall, wet forest, where it can grow to be a massive tree, but it also grows in dry sclerophyll forests, and even in coastal heath. 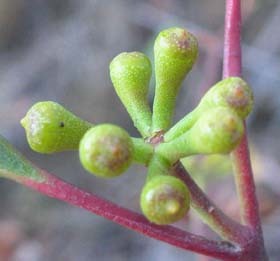 It even grows as a mallee in coastal areas. 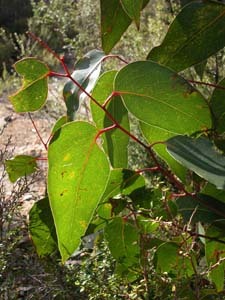 Like E. delegatensis, E. regnans and E. sieberi the adult leaves are relatively large (often >10cm long and usually more than 3cm wide), and have asymmetrical bases. 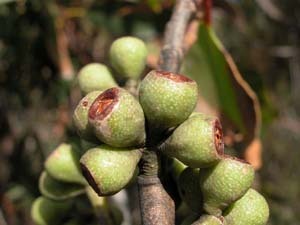 The trunks and main braches are covered in fibrous bark (unlike E. delegatensis and E. regnans, in which fibrous bark does not extend onto the branches). E. sieberi also has rough bark, but this is much coarser than in E. obliqua.